For Beth Cornell, painting a nesting doll for the first time was a fun challenge. As with many artists, one small hurdle was getting used to the three-dimensional surface. Luckily, the process of painting on a rounded wooden surface gets easier with each doll in the nesting doll set. Look at this fantastic stacking doll created by artist Fred "Smitty" Smith. 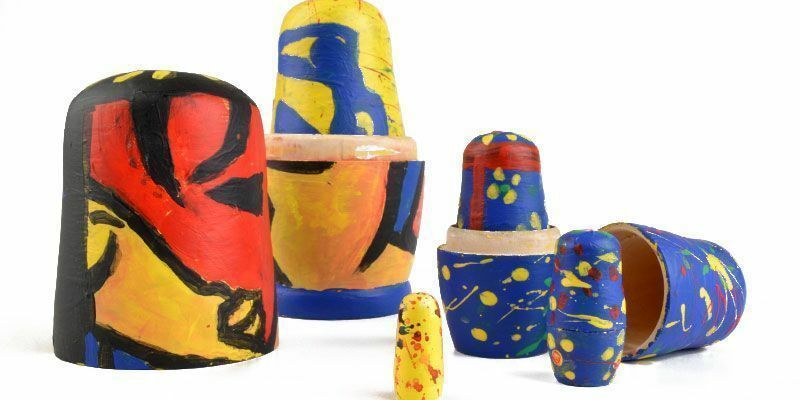 He used just a few colors to create a bright and modern looking matryoshka nesting doll. The unfinished wooden doll (six dolls total) needed a white slate first. Then, it was up to Fred's imagination. Gourd artist Sheri Harris paints a Russian nesting doll. "Our Nest is Blessed" A modern artist's nesting doll project.